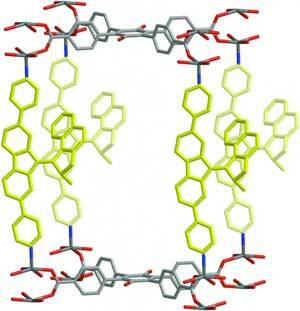 (Nanowerk News) For molecular motors to be exploited effectively, they need to be able to operate in unison. However, integrating billions of these nanometre-sized motors into a single system, and getting them to operate in unison has proved to be quite a challenge. 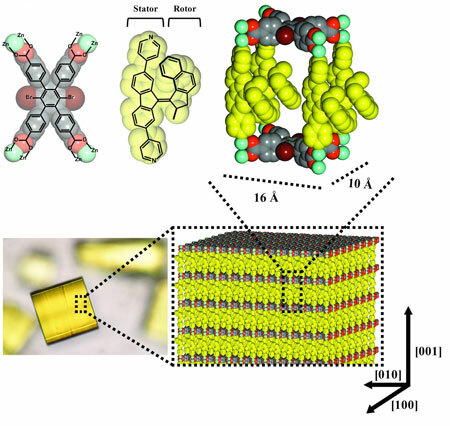 Organic chemists at the University of Groningen have now succeeded in integrating numerous unidirectional light-driven rotary motors into a metal-organic framework (a solid material with a 3D cage-like structure). Details of their discovery were published in the journal Nature Nanotechnology ("Unidirectional rotary motion in a metal-organic framework"). Another potential application would be to feed the motorized MOF with materials that would then react inside the cages before being pumped out again. However, much more research is needed before any of these applications can become a reality. One potential issue, for example, is that materials passing through the cages could interfere with the operation of the motors, causing the system to clog up. Nevertheless, the system presented by Prof. Feringa and his team will provide a springboard for further explorations of the collective behavior of rotary motors integrated into 3D arrays.